The Great Basin is a phenomenal place for research on the time-scales, progression, and drivers of deformation and landscape evolution at the regional- and orogen-scale. It is the birthplace of models for fold-thrust belts, extensional systems, and strike-slip fault zones. This region is a natural laboratory that allows for increasingly sophisticated structural geology and tectonic hypotheses to be tested. My research interests in the Great Basin are focused on Late Cretaceous to Eocene exhumation in the hinterland of the Sevier orogenic belt, Miocene Basin and Range extension, and the Pliocene to recent transition to dextral transtension associated with the development of the eastern California shear zone. Figure 1. Map of the western U.S. showing Sevier and Laramide thrust belts, core complexes, paleodivides, and paleorivers at ~55-45 Ma with Eocene sediment sample locations. Figure modified from Wells and Hoisch (2008), Henry et al. (2012); and Dumitru et al. (2012). The Late Cretaceous to early Cenozoic hinterland of the Sevier retroarc fold-thrust belt in western North America is widely interpreted as a broad plateau, coined the Nevadaplano by analogy to the modern Andean Puna-Altiplano (e.g., Coney and Harms, 1984; Dilek and Moores, 1999; DeCelles, 2004). Although there is general consensus that this erosional highland was in place by the mid-Eocene, the details of the development of the Nevadaplano remain controversial (Wakabayashi and Sawyer, 2001; Mulch et al., 2006; Molnar, 2010; Henry et al., 2012). This study uses new bedrock and detrital (U-Th)/He ages combined with published thermochronology data from the Sierra Nevada, western Great Basin, and Mojave Desert to constrain the timing, spatial pattern, and magnitude of Late Cretaceous to early Cenozoic cooling. We are also evaluating possible dynamic controls on the cooling history of this broad region. Collaborators include: Daniel Stockli (UT) and Doug Walker (KU). A related aspect of the Late Cretaceous to early Cenozoic history of the North American Cordillera, is the development of the basal Paleogene unconformity, a semi-continuous erosion surface that is widely recognized across the Great Basin and Sierra Nevada. The unconformity forms the boundary of Paleozoic sedimentary rocks and Mesozoic granitoids with overlying Cenozoic volcanic and sedimentary rocks. Recognition of the unconformity dates to 1911, where its presence was documented beneath ‘auriferous gravels’ in the Sierra Nevada. The unconformity is an important datum for cross section restorations and paleodepth reconstructions, but the history of exhumation and erosion associated with its development are poorly understood. Preliminary research on this topic is being carried out through the development of a database of more than 1000 published and unpublished (U-Th)/He, fission track, 40Ar/39Ar, and K/Ar dates from across the Great Basin and Sierra Nevada. The data are derived from a breadth of thermochronometers (e.g. apatite, zircon, biotite, muscovite, hornblende, titanite) that covers a temperature window from 75 to 375°C. The data will be combined with sub-crop maps and balanced cross sections to explore paleotopography and crustal thickness trends, erosion rates, sediment dispersal patterns, and dynamic drivers responsible for the Late Cretaceous to Pliocene exhumation. The results will also inform future field-based investigations and research efforts. Figure 2. Shaded relief map of southern California and western Nevada showing the spatial and temporal distribution of cooling ages from the Sierra Nevada, western Great Basin and Mojave Desert. Cooling age data are scaled and stacked with age. AHe – Apatite Helium; AFT – Apatite Fission Track; BAr – Biotite K/Ar or 40Ar/39Ar; ZHe – Zircon Helium; ZFT – Zircon Fission Track. Data sources: Mojave – Armstrong and Suppe (1973), Miller and Morton (1980); Foster et al. (1991, 1992); Wells et al. (2005); Sierra Nevada – Dumitru et al. (1990), House et al. (1997; 2001), Cecil et al. (2006), Clark et al. (2005), Maheo et al. (2009), Blythe et al. (2013); Western Great Basin – Surpless et al. (2002), Stockli et al. (2002; 2003), Lee et al. (2009), Mahan et al. (2009); Ferril et al. (2012), Gorynski et al. (2013), and Walker et al. (2014). 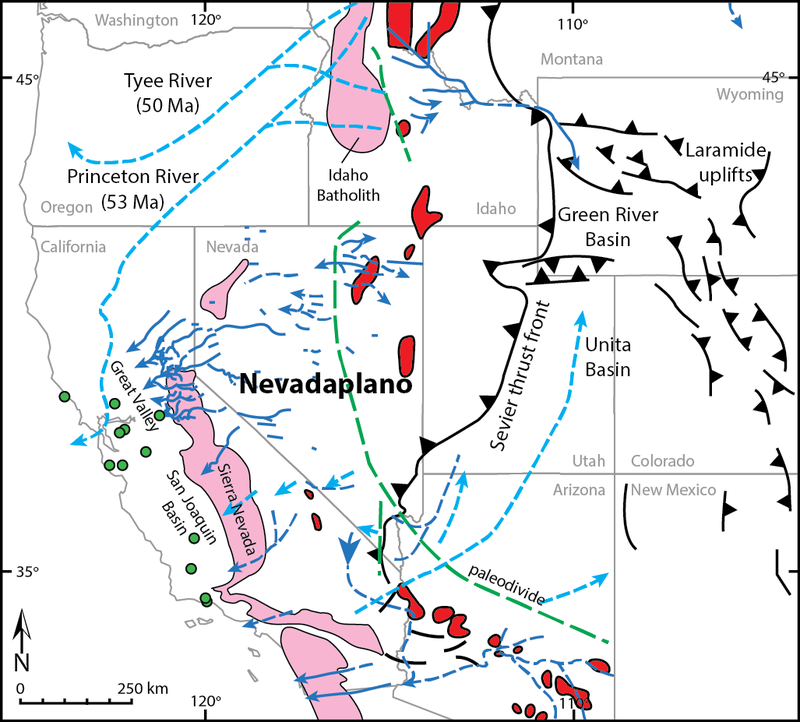 The central Basin and Range province of southern Nevada and southeastern California has experienced both Miocene extension and Miocene to recent transtension. This unique positioning has made the region instrumental in the development of kinematic and dynamic models for continental rifting and strike-slip faulting. Two classes of competing models have been proposed for the development of low-angle normal and strike-slip faults in the region. One set of models suggests that motion on normal and strike-slip faults is synchronous (e.g., rolling hinge and pull-apart models). The other proposes a two-phase history, with extensional faults being reactivated and/or overprinted by a relatively young phase of strike-slip faulting. Although my recent investigations in eastern California (e.g., Walker et al., 2014; Bidgoli et al., 2015) suggest a two-phase history may be more accurate, additional research will clarify the role of individual structures in the development of the Basin and Range and the eastern California shear zone. On-going efforts with my colleague Joseph Andrew (KU), center on incorporating thermochronology-based fault timing constraints into a revised palinspastic restoration for the central Basin and Range. Future projects will expand on earlier studies to evaluate along-strike variations in fault slip and strain transfer among faults through field mapping, structural analysis, bedrock (U-Th)/He thermochronology, and detrital zircon U-Pb-He double dating of basin-fill. Figure 3. Geologic cross sections across the central Black Mountains (A-A’), southern Black Mountains (B-B’), and central Panamint Range (C-C’). Thermochronology samples, shown as dots, are projected into the plane of each cross-section. In this projected view, samples may lie above or below topography of the section line. Mean zircon (black diamonds) and apatite (white diamonds) (U-Th)/He ages and errors (1σ standard deviation) are shown above each sample. Strip maps below each cross section show sample locations with respect to the line of the section. Geology from Drewes (1963), Hunt and Mabey (1966), and the compilation of Workman et al. (2002).